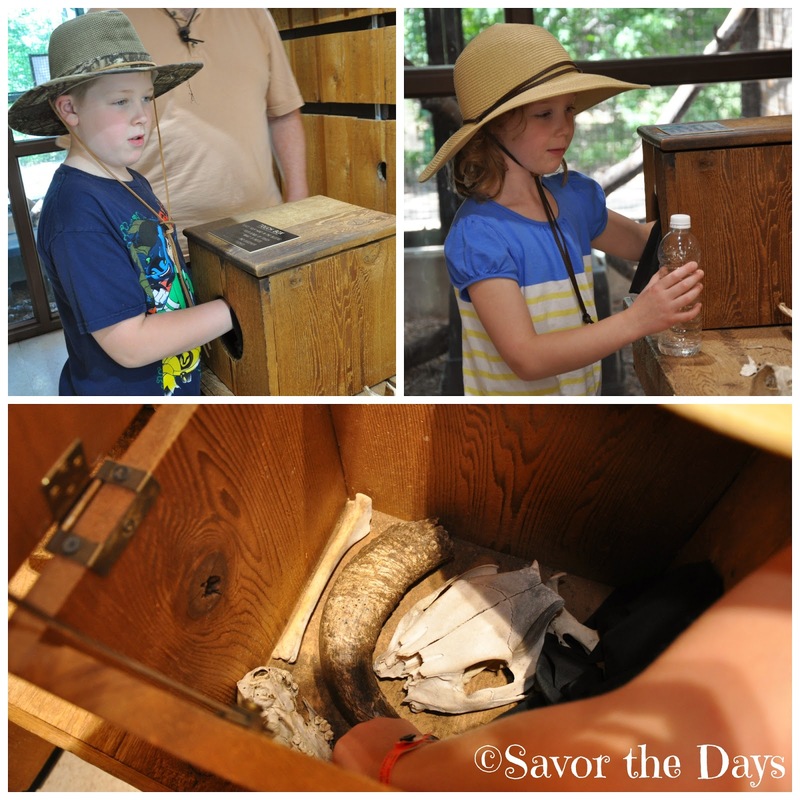 We spent the day out in nature at the Fort Worth Nature Center and Refuge. This is a great place to just explore on your own. There are miles and miles of trails with so much to find along your way. Here are some pictures of our discoveries. We started our visit in the Nature Center where we attended a class about turtles. Although people see turtles all the time, they rarely get a glimpse of the inside of a real turtle shell. You can really see why the shell is an exoskeleton. It looks just like a backbone. The instructor brought each turtle around so we could touch it and look closely at it. This red-eared slider was tucked tightly into his shell. We got to touch most of the turtles as they came by. Rachel touched them all without hesitation. We learned about the snapping turtle and got to see it up close but we weren't allowed to touch him. Look at that big tooth! I wouldn't want to touch him anyway! This bull snake seemed to be playing with Nicholas. Where ever Nicholas moved his finger, the snake would slither over to it as if he was trying to catch the finger. There are several turtles, snakes, and other creatures to view in the Nature Center. It is open from 9:00 - 4:30 every day. I loved seeing the display encouraging kids to try to guess the animal who left these tracks. Nicholas was quite good at this. There are a couple of "Touch Boxes" where you can put your hand in a hole, feel around, and try to guess what you are touching. Then you can open up the top and look in to see if you guessed correctly. So fun! I also love their "Touch Table" which had seed pods, sticks, shells, rocks, turtle shells, snake skin, bones, antlers, and so much more! Outside the Nature Center we took a closer look at this plant. At first glance, Rachel said this was Poison Ivy. I asked her to count the leaves. It has 5 leaves so she realized that it couldn't be Poison Ivy. I told her it was Virginia Creeper which looks a lot like Poison Ivy and is often mistaken for Poison Ivy. She spent some time searching through the gravel. She loves rocks! We decided to take the Caprock Nature Trail. I like that each trail head has markings to show what you might see along your travels. I'm so grateful to my hubby for sharing my love for the great outdoors and his sense of adventure! 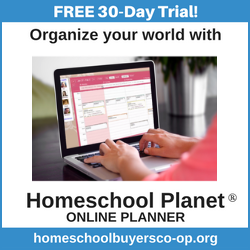 When we go out on nature hikes, we don't go with a particular activity or lesson plan in mind. We just notice things around us and share what we find with each other. 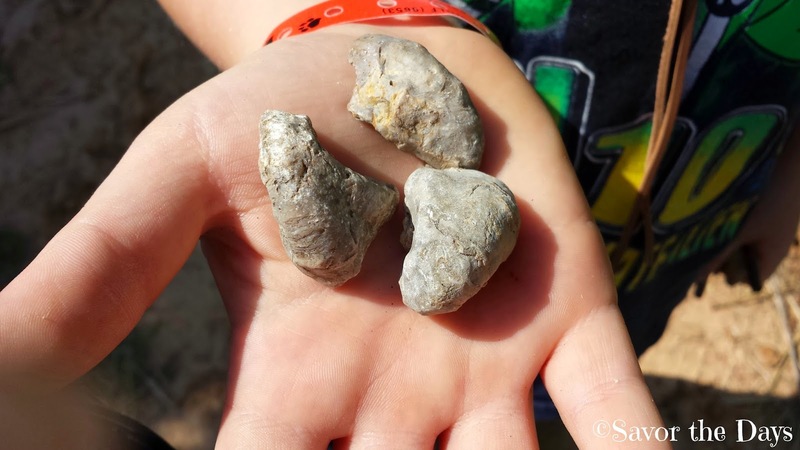 We found tons of these Devil's Toe Nail fossils. Their real name is Gryphaea and they are an extinct oyster from a time when this part of the land was under the ocean. Nicholas found a Rhinoceros Beetle. Stuart picked up some dead bark it was on and showed it to Rachel (who didn't seem to like it!). But she was happy to show off a giant seed pod she found. And she caught a Daddy Long Legs and put it on her Daddy's hand. We found some cool track prints. They could be a dog but they were really big so we think they may be a wolf. Nicholas also found some little raccoon tracks. It is exciting to see my kids have such an interest in nature. They enjoy exploring and studying plant and animal life around them. These three leaves have unusual red bumps on them yet none of the other leaves on the plant had them. We didn't bring nature guides with us to look things up but I think these were caused by some type of gall bug. This happens when particular bugs lay eggs on the leaves and these galls form to protect the egg. But I'm not positive that this is what they are. It will be a mystery for us to research online. While exploring, Rachel touched some plants that were right next to Poison Ivy. She wasn't sure if she had actually touched the Poison Ivy plant so just to be safe she washed her hand in the river. That is really the best thing you can do if you have contact with Poison Ivy. Don't try to rub the skin with your shirt because you will just spread the urushiol oil to more places. Rachel found some wild berries. We came up to the kids' favorite spots - the bird blind! It is a great little deck area with a beautiful view of the river. We always plan to have our snacks here. There are lots of little windows that you can open and close depending on your height and how much cover you need to watch the birds. We found lots of interesting homes for stinging insects up in the ceiling rafters. Rachel and Nicholas wandered out of the blind to explore at the river bank. Rachel ended up in an area that had Poison Ivy and she didn't have long pants on to protect her so Daddy swooped in an carried her out of there. Look at the big smile on her face as she is being rescued! We saw a fisherman catch a big fish! Oh wait! There really is a monkey here! It is not often that we find Ring-Tailed Lemurs on our nature hikes! Just then we saw a canoe pull up on the river. The lemur was their pet and had not been on his leash so he jumped to the bank as they approached. He climbed to the top of a tree and wouldn't come down even with the owners calling for him and with us offering snacks to him. I noticed Nicholas playing with a giant stick and wondered why in the world he was playing with sticks instead of checking out the Lemur. I should have known my boy better than that. He had a plan! He propped the stick up against the tree to give the Lemur another way to get down from the tree. It worked! The owner caught him and put his leash back on. She let the kids touch him. He was so soft and sweet. Once the excitement was over, it was time to get back to playing at the river. Stick required, of course. I caught a picture of Rachel smiling but then once she saw me taking her picture she winced her mouth up to look silly. What is silly are those muddy shoes on her feet! The boy explored around on the rocks. My handsome little guy is so at home when he is outdoors! 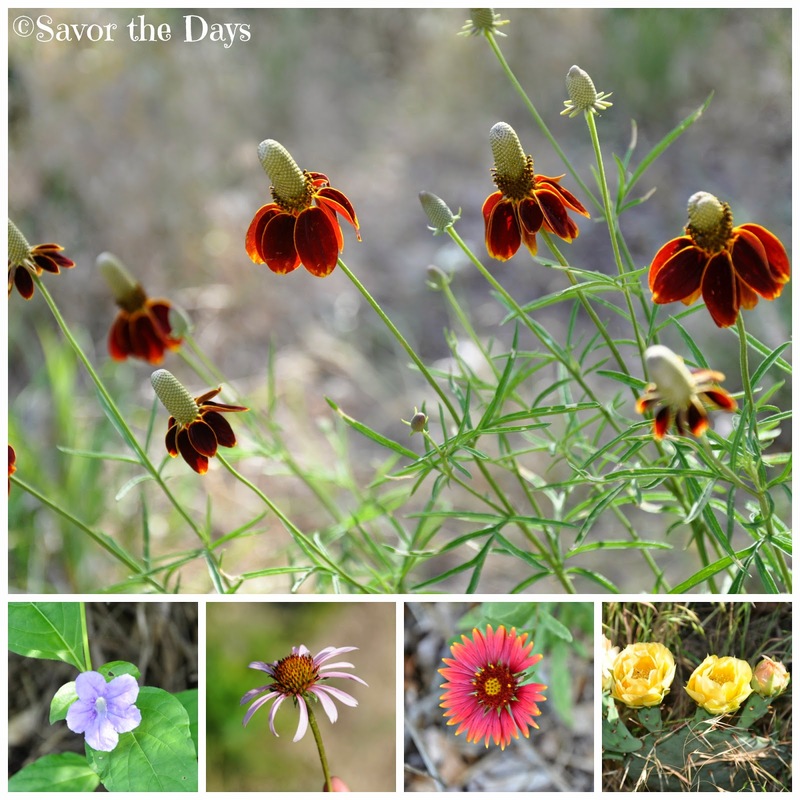 We saw lots of wonderful wildflowers along our trail. 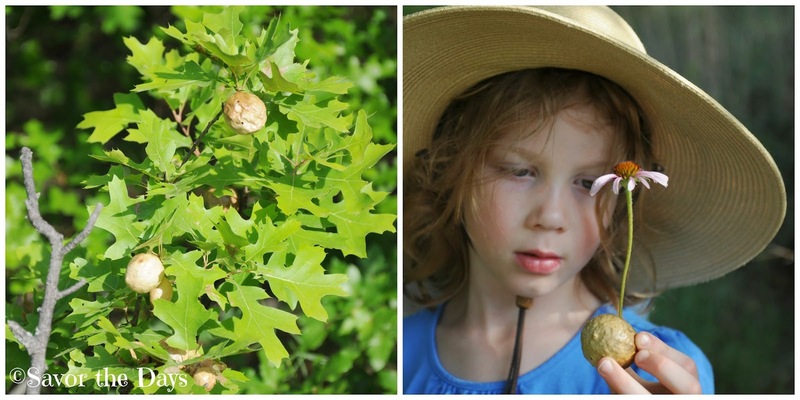 We also found some oak galls. These are caused by gall wasps and they are just hollow little balls on an oak tree. Rachel found one on the ground and used it as a vase to hold water for her picked flower. What a resourceful idea! We made it back to the car but on our way out of the reserve, we had to stop at Prairie Dog Town. It is just a little piece of land that is full of underground tunnels that are home to many cute little prairie dogs. It is fenced off so you can't get close to the little guys but it is fun to just watch them pop up out of their holes then scurry back inside. There is so much to see at the Fort Worth Nature Center and Refuge at this time of year. 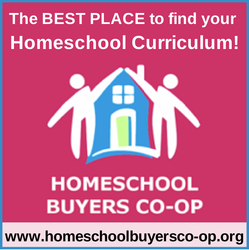 It made for a wonderful family adventure and I highly recommend it. The Fort Worth Nature Center and Refuge is located at 9601 Fossil Ridge Road in Fort Worth. They are open 7 days a week. Entrance fees are $5 adults, $3 children but kids under age 3 are free. For more information, please call them at 817-392-7415 or check out the Fort Worth Nature Center and Refuge website. You can also follow them on Facebook.